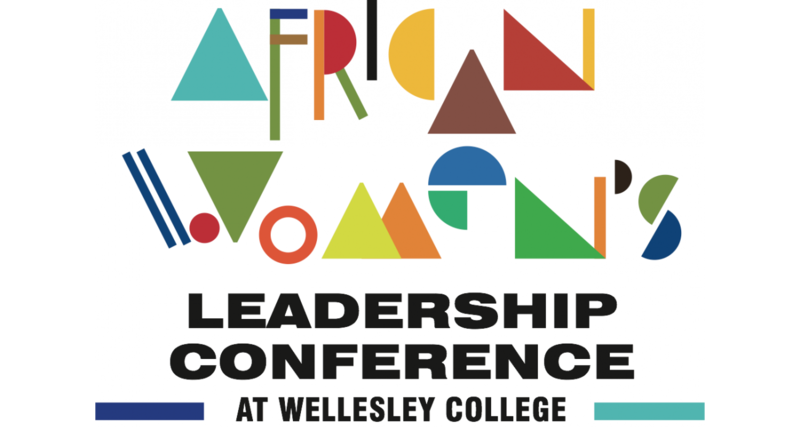 The African Women's Leadership Conference at Wellesley College is a first-of-its-kind convening of some of the most influential voices in African women's leadership. Organized by Wellesley College in collaboration with the Mastercard Foundation, this timely and important conference will expand our understanding of the many ways women leaders are transforming their communities and their nations; it promises to advance thought leadership and provide opportunities to learn from the women who are making a difference not only across Africa but around the world. In lectures, breakout sessions, and informal discussions, attendees will explore what women’s leadership looks like through the lens of four key leadership competencies—confidence, creativity, courage, and resilience—leading to a deeper appreciation of the challenges African women leaders face and offering productive strategies for addressing them. Kakenya Ntaiya is the founder and president of Kakenya’s Dream, an organization that provides life-changing education to empower girls, ends harmful traditional practices, and uplifts rural communities in Kenya. She is a powerful advocate who has channeled her own experiences into creating change in her home community. 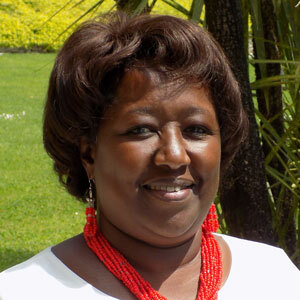 Global health champion Agnes Binagwaho, MD, M(Ped), PhD is the vice chancellor of the University of Global Health Equity (UGHE), former minister of health of Rwanda, and a member of the National Academy of Medicine (NAM). She worked for 20 years in the public health sector in Rwanda. From 2002 to 2016, she served the Rwandan Health Sector in high-level government positions, first as the executive secretary of Rwanda’s National AIDS Control Commission, then as permanent secretary of the Ministry of Health, and then five years as minister of health. She is currently a senior lecturer in the Department of Global Health and Social Medicine at Harvard Medical School, and an adjunct clinical professor of pediatrics at Dartmouth’s Geisel School of Medicine. Professor Binagwaho was named vice chancellor of UGHE in 2017. Internationally known as “Africa’s Iron Lady,” Nobel Laureate Ellen Johnson Sirleaf is a leading promoter of freedom, peace, justice, women’s empowerment and democratic rule. As Africa’s first democratically elected female head of state, she has led Liberia through reconciliation and recovery following the nation’s decade-long civil war, as well as the Ebola Crisis, winning international acclaim for achieving economic, social, and political change. Anne Kansiime is a Ugandan comedian and actress. 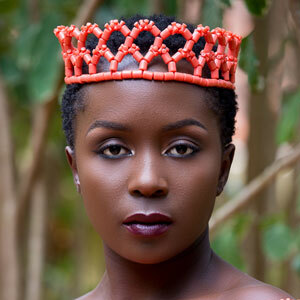 Dubbed “Africa’s Queen of Comedy,” she currently hosts the television show “Don’t Mess With Kansiime,” and belongs to a sketch comedy group called Fun Factory. Her YouTube channel has amassed more than 50 million views and 400,000 subscribers. 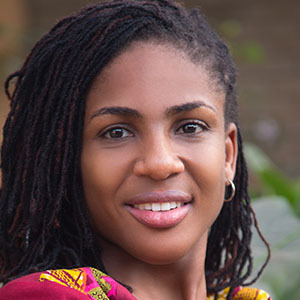 Farida Nana Efua Bedwei is the co-founder and chief technology officer of Logiciel (Ghana) Ltd, a software company developing banking systems for the microfinance industry. She believes that if Ghanaians (and for that matter Africans) got creative, we’d be able to find realistic ways of solving our problems. We don’t need aid, we just need to work smarter and make use of our resources, not just the natural ones, but the intellectual ones as well. Hauwa Ibrahim is a Nigerian human rights and Shariah law attorney with over twenty years of experience representing women and children condemned to death in Shariah courts. Ibrahim is founder of the Aries Law Firm and author of Practicing Shariah Law: Seven Strategies for Achieving Justice in Shariah Courts. This is a pre-conference event for Mastercard Foundation Scholars only. Maame Afon identifies herself as a “Whole Woman”, showing up as an activist, international development practitioner, mentor, coach, wife, mother, and recording artist who uses music to promote philanthropy and social justice. She describes her music as “wholesome”, blending gospel and inspirational sounds. Maame Afon serves as Director, Programs and Partnership at Moremi Initiative, a pan-African organization working to equip, engage and inspire a new generation of African women Leaders. In addition, she serves on the board of African Women’s Development Fund–USA (AWDF-USA), We Care Solar (Secretary), Women Thrive Alliance, Cocoa 360 and Ghana Bamboo Bikes Initiative (Vice Chair). She is co-founder and lead trainer/facilitator with MILT LLC— (Management for Impact leadership and Transformation). Maame lives by the motto “Do Good, but first Do no harm”. Her faith is integral to everything she does, and she enjoys raising her three children. Abigail Burgesson is an international development practitioner, feminist and women’s rights activists with 21 years of experience in the Non-profit sector in Ghana and internationally. She is a member of the Senior Management Team at African Women’s Development Fund (AWDF) and serves as Special Programs Manager responsible for fundraising, partnership and outreach. Prior to joining AWDF, Abigail worked extensively in Democratic Governance and Human Rights. Abigail’s expertise cuts across a range of issues including women’s rights and leadership, women’s economic security, health and reproductive rights, education, social change and philanthropy. She uses this vast and diverse background as a resource person, trainer, facilitator, moderator, mentor and motivational speaker. In recognition of her contributions to women’s rights, Abigail received an award for Feminist Leadership in Africa from Akina Mama Wa Africa (AMWA) Leadership Institute in 2008. In line with her passion for women’s rights, she volunteers her experience in support of women’s right, currently serving on the Council of Advisors for Wellesley Centers for Women at Wellesley College in Boston, USA. Additionally, she is a board member with Women’s Funding Network (WFN), and previously served on the board of Prospera— an International Network of Women’s Funds in Mexico. In May 2015, Abigail was nominated by the State Department and the United States Agency for International Development (USAID) to represent Civil Society Organizations in Ghana at the 15th African Growth and Opportunities Act (AGOA) Africa Trade and Economic Forum. Abigail graduated from the University of Ghana with a BA in English, and obtained an MA in International Relations from Boston University’s European Program in the UK. She has also received training in relevant courses, including a program in International Negotiations from the Centre for Applied Studies in International Negotiations in Geneva, Switzerland. Abigail is married and lives in Ghana, West Africa with her husband and three children. As a producer, Joey worked for a variety of programs including CNN Piers Morgan Tonight, The Today Show, and The Montel Williams Show. She began her professional career at Dateline NBC. Joey is a recipient of numerous awards including two News Emmys. She received her M.S. from Columbia University Graduate School of Journalism. Joey attended Wellesley College where she obtained a B.A. in Anthropology, and graduated with Latin Honors. President Paula A. Johnson is a highly respected and passionate leader, deeply committed to women and to sustainably improving their lives. She is recognized internationally as an innovator who has brought her broad range of experience as a researcher, educator, and expert in health care, public health, and health policy to bear in the effort to advance the well-being of women. With a remarkable track record of accomplishments—she founded the Connors Center for Women’s Health and Gender Biology at Brigham and Women’s Hospital—she has led in the field of women’s health, taking an approach to biology that integrates insights from sociology, economics, and many other fields. Johnson was the Grayce A. Young Family Professor of Medicine in Women’s Health at Harvard Medical School, as well as professor of epidemiology at the Harvard T.H. Chan School of Public Health. Her research, her vision, and her interdisciplinary approach to leading at the intersection of health care, education, and public health have placed her in key leadership roles in organizations around the world. Yanvalou Drum & Dance Ensemble is a faculty-directed ensemble that performs the folkloric music and dance of Africa as it exists today throughout the African Diaspora, particularly in Haiti. Students perform on authentic instruments, experience a variety of cultures through their music, and present several concerts during the academic year. The ensemble is comprised of students, staff and visiting artists and is directed by Kera Washington '93 and advised by Professor Emeritus Gerdes Fleurant. Filomina C. Steady is Professor and Chair of Africana Studies at Wellesley College. She has taught at several universities including Yale, Wesleyan, Boston, Sierra Leone and California State University in Sacramento, where she was also chair of the Women’s Studies Program. She is the recipient of several awards, including The Otelia Cromwell Distinguished Alumna of Smith College. She has authored or edited several books, including The Black Woman Cross-Culturally. Her other books include Women and Collective Action in Africa; Environmental Justice in the New Millennium and Women and Women and Leadership in West Africa. Dr. Steady has served as a Special Advisor and Director of the United Nations and on several advisory boards on gender equality and the advancement of women. She is a founding member of the Association of African Women for Research and Development (AAWORD). She is married to Dr. Henry Steady and is the mother of three children. African historian focusing on Somalia and Sudan with a long-term research and teaching focus on Islamic and Middle Eastern history; translator of historical and popular culture texts in Arabic and Somali. Tanyaradzwa Chinyukwi is a Mastercard Foundation Scholar at EARTH University, pursuing a degree in Agricultural Engineering and Natural Resources Management. She has a passion for cereal science and soil science; fields which are central in alleviating poverty in her country and the world at large. While at EARTH University, Tanyaradzwa co-founded and was the finance manager of ECOPULPS SA, a three-year business project that ventured into production of natural juice. Tanyaradzwa ́s motivation for social change comes from her upbringing. Having grown up with her widowed mother, she understands the challenges that women and girls face in societies, the most stinging being the lack of access to opportunities. This triggered Tanya into thinking of better ways of both economically and socially empowering females so that they become better people in a society that undermines them. In 2016, Tanyaradzwa came up with the Girl Power Initiative, a campaign aimed at raising awareness of the importance of investing in the education of the girl child in Zimbabwe. As a result, she was awarded the X-factor Prize as a Global Campaign Winner by the Millennium Campus Network (MCN); making her a member of the MCN Global Gender Network which seeks to address the challenges being faced in different societies by both men and women. As an extension of her work, Tanya has come up with a peer group to teach girls in primary school about reproductive health. Currently, Tanyaradzwa is the president and co-founder of ZAZI Growers’ Network, an innovative community-based project that aims at helping vulnerable women access better markets for their agricultural products to improve their economic potential, and above all, sustain their families. Eunice Adjoa Yeboah Adu is currently a final year Mastercard Foundation Scholar at Ashesi University College, pursuing a degree in Business Administration. She has a passion to develop the youth especially women. To pursue this passion, Eunice served as the Programs Coordinator of Bowney (previously known as A New Dawn) and as a career counsellor at Awutu Winton Senior High School. Eunice believes that Africa’s development would never be complete if women are sidelined, ignored and abused. True development means complete development of EVERYBODY. My name is Jennifer Amuah, nineteen (19) years of age, a Ghanaian and currently enrolled in the University of Ghana. I was born in the Central Region of Ghana, where I had my primary, my junior high and my secondary school education. I am a girl who stands for right and sees to the advancement of a better and a brighter future not only for my community but for the world at large. I belong to a family of five and I happen to be the only girl-child of my parents. I have over the years assumed the positions of a President to a group, served as a General Secretary and in one of my younger days served as a House Representative, all in the Senior High School. I currently serve as a Member of Parliament of the Junior Common Room in my Hall of Residence and I also serve as a General Secretary to a religious body in my institution of study, the University of Ghana. Growing up in a community where women were only seen and not heard, I vowed to myself not only to restore the glory of these women but also to ensure a bringing forth of a generation of great and innovational thinkers; a generation that would not only lead change but would instill great and tremendous change in the hearts of many. Change I believe comes from inside thus we must be the change we desire to aspire. Ivy Mwai manages relationships across a portfolio of partners for the Mastercard Foundation Scholars Program. Prior to joining the Foundation, she was the General Manager, Education Pillar at Equity Group Foundation where she oversaw the management of over 6,000 students in the Mastercard Foundation partnered Wings to Fly secondary scholarship program. Prior to that, she was the Admissions Director at African Leadership Academy and has been involved with youth and education in various organizations, has been in advertising, marketing and communications, and in her personal capacity involved with Kenya Red Cross. She has a Bachelor of Art in International Relations and French, Honours from Ohio Wesleyan University. Dr. Agnes Binagwaho is a Rwandan pediatrician who served as the Minister of Health of Rwanda for 5 years, from May 2011 until July 2016. After practicing as a pediatrician for over 15 years, Dr. Binagwaho led the National AIDS Control Commission between 2002 and 2008. She then served as Permanent Secretary in the Ministry of Health from 2008 until 2011. Dr. Binagwaho serves on many academic boards academic. Her engagements include research on health equity, HIV/AIDS, information and communication technologies (ICT) in e-health, and pediatric care delivery systems. She has published over 100 peer-reviewed articles, serves on the International Advisory Board of Lancet Global Health, the Editorial Board of PLoS Medicine and of Health and Human Rights: An International Journal, and contributed to multiple books. She chairs the Rwanda Pediatric Society, is a member of the Global Task Force on Expanded Access to Cancer Care and Control in Developing Countries. Dr. Binagwaho is currently a Senior Lecturer in the Department of Global Health and Social Medicine at Harvard Medical School, a Clinical Professor of Pediatrics at the Geisel School of Medicine at Dartmouth College, and a Professor of the Practice of Global Health Delivery at the University of Global Health Equity in Rwanda. She also serves on the International Strategic Advisory Board for the Institute of Global Health Innovation at Imperial College London. Dr. Binagwaho received an Honorary Doctor of Science degree from Dartmouth College in 2010. In 2014, she received her Ph.D. from the University of Rwanda. She is active in advocacy and political mobilisation on behalf of women and children, in Rwanda and worldwide. Mfoniso Udofia is a first-generation Nigerian-American storyteller and educator. She’s the recipient of the 2017 Helen Merrill Playwright Award and the 2017-2018 McKnight National Residency and Commission at The Playwrights’ Center in Minneapolis. Her Ufot Cycle play, Her Portmanteau, will be produced this spring by Pasadena’s Boston Court Performing Arts Center. Mfoniso is currently translating Othello for Oregon Shakespeare Festival’s PlayOn! Program. She’s also the Founding Artistic Director of the NOW AFRICA: Playwrights Festival and a proud member of New Dramatists’ Class of 2023. Mfoniso’s plays have recently been produced by The New York Theatre Workshop, Magic Theater, and The Playwrights Realm. Please follow Mfoniso at www.mfonisoudofia.com. Lois Roach is engaged in presenting creative works for the stage, bringing performance opportunities to Boston youth, and producing community-focused events. She works at furthering arts education through my work as project manager of First Night's Neighborhood Network, connecting artist/educators to youth programs throughout Boston, providing performance and visual exhibition opportunities for youth. Through Company One’s ARTiculation, she works with young spoken word artists on an ongoing touring performance. Lois directed the New England premiere of Legacy of Light for the Lyric Stage Company of Boston, where she also helmed Crowns and the award-winning Old Settler. She directed the critically acclaimed ARTiculation for Company One; the Providence, R.I., premiere of Treemonisha by Scott Joplin for Opera Providence plus the New England premieres of A House with No Walls, A Lesson Before Dying, and Having Our Say for the New Rep Theater. She also developed a touring company with an original play about AIDS, Living On..., currently under agreement with Baker’s Plays. Her play, The Emancipation of Mandy and Miz Ellie, premiered in spring 2010. Dr. Kakenya Ntaiya is the Founder and President of Kakenya’s Dream, an organization that educates girls, ends harmful traditional practices, and uplifts their communities. Dr. Ntaiya was engaged at age 5, and raised with the expectation that she would undergo female genital mutilation (FGM) and marry as a teenager. but Kakenya had a different dream. She negotiated with her father to return to school after undergoing FGM. When she was accepted to college in the United States, she promised her community she would use her education to help the village in exchange for their support. Kakenya went to earn her PhD in education from the University of Pittsburgh and returned to her community to fulfill her promise. In 2009, the Kakenya Center for Excellence boarding school opened doors, serving 30 students. Today, Dr. Ntaiya reaches thousands of young girls, boys and community members each year through the visionary and girl-centered programs she pioneered at Kakenya’s Dream. Layli Maparyan, Ph.D., is the Katherine Stone Kaufmann ’67 Executive Director of the Wellesley Centers for Women and Professor of Africana Studies at Wellesley College. She is best known for her scholarship in the area of womanism and is the author of two groundbreaking texts in the field of womanist studies, The Womanist Reader (Routledge, 2006) and The Womanist Idea (Routledge, 2012); a third book is forthcoming. Maparyan has also published significantly in the areas of adolescent development, social identities, (including biracial/biethnic identity and the intersections of racial/ethnic, sexual, spiritual/religious, and gender identities), Black LGBTQ studies, Hip Hop studies, and history of psychology. Maparyan’s scholar-activist work interweaves threads from the social sciences and the critical disciplines, incorporating basic and applied platforms around a common theme of integrating identities and communities in peaceable, ecologically sound, and self-actualizing ways. This event is open to the public. Please register if you are not already registered for the full two-day conference. Kansiime Kubiryaba Anne popularly known as Anne Kansiime, is a Ugandan comedian and actress. She was born in Mparo, Kabale District, in the Western Region of Uganda. Her father is a retired banker, and her mother is a housewife. She belongs to a sketch comedy group called Fun Factory. The group plays every Thursday evening at the National theatre in Uganda. Kansiime tours as a standup comedian and her comedy style tends to focus on aspects of her personal life and social issues common to society. Her YouTube videos receive millions of views and she has played to packed houses in Blantyre, Gaborone, Kigali, Kuala Lumpur, Luton, Adelaide, Montreal, Lilongwe, London, Lusaka and Harare among others. Kansiime boasts of multiple awards and has been referred to as "Africa's Queen of Comedy" by some media outlets. Ann Miles is the Director of Thought Leadership and Innovation at the Mastercard Foundation, a new role she took on at the beginning of this year. Ann joined the Foundation in 2011 as the Director of Financial Inclusion. She also managed the Youth Livelihoods team from 2014-2016. She is a member of the Foundation’s Strategy and Investment Team and represents the Foundation in the board of Solutions for Youth Employment, a coalition of organizations committed to addressing the challenges of youth employment around the world. Ann has more than 35 years of experience in financial services. One of her most rewarding periods was when she worked at Women’s World Banking, a global non-profit organization which works with financial institutions to develop products and services suitable for low-income women. The organization also promotes women’s leadership and focuses on those institutions where women are leaders. Thought leadership and innovation will play a critical role in helping the Foundation achieve its new strategy which will be announced later this month. Ann is excited about these initiatives and looks forward to engaging many of our partners as well as new stakeholders in our future work. Karen Zuffante Pabon has been involved in the fields of international education and immigration for more than 30 years. She holds a bachelor’s degree in Spanish literature from Colby College and a master’s degree in Latin American development from Georgetown University. Karen has studied abroad and worked in Spain, Mexico, Colombia, Japan, and the Philippines, and speaks Spanish fluently. She has been in a director’s role for the past 10 years, but her professional experience ranges from teaching English as a second language to intercultural consulting, immigration legal assistance, and international student advising. She has worked as an international student and scholar advisor at Georgetown University, MIT, the University of Texas at Austin, Yale University, Teikyo Post University, and most recently at Babson College where she contributed greatly to internationalization efforts and global competency training. Throughout her experience, she has been devoted to increasing intercultural understanding and bridging cultural gaps. At Wellesley, Karen provides vision and leadership in the development and implementation of programs, services, and policies that strengthen and celebrate Wellesley's intercultural community. She also oversees federal immigration compliance for students and scholars, and works with approximately 300 international students and scholars on immigration issues, and cultural adjustment. Karen has served as a member of the NAFSA: Association of International Educators Region XI Team, Chair of the Region XI Government Regulatory Advisory Committee (GRAC) and Chair of the International Careers Consortium. She is currently a NAFSA Trainer Corp member. 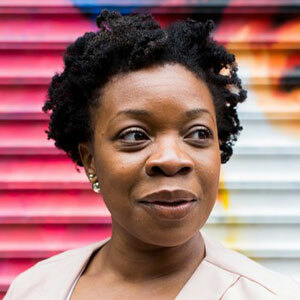 Farida Nana Efua Bedwei is the Co-founder and Chief Technology Officer of Logiciel (Ghana) Ltd, a software company developing banking systems for the microfinance industry. Her role involves assessing the industry and coming up with practical solutions, which are easy to use by persons with no formal banking training. She believes the informal sector, which make up between 60%-70% of the population across Africa, deserve the same banking services as those in the formal sector. Thus by building affordable banking systems for them, the microfinance industry will be able to realize their full potential and offer adequate banking services to their customers. 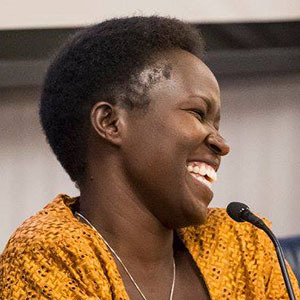 Farida is also an author and a disability-rights advocate, and has been featured on many media platforms, notable amongst this is CNN African Voices in February 2015. She has also won a number of local and international awards, and was adjudged the most influential woman in business and governance (finance sector) for her work in computerizing the microfinance industry. She served on the Board of the National Communication Authority nearly 3 years and has been an executive member of Sharecare Ghana (an NGO which raises awareness for persons with autoimmune and neurological conditions), for the past 4 years. She has also been appointed as a Young Global Leader by the World Economic Forum. Kellie Carter Jackson is a 19th century historian in the Department of Africana Studies. Her upcoming book, Force & Freedom: Black Abolitionists and the Politics of Violence (University of Pennsylvania Press), examines the conditions that led some black abolitionists to believe slavery might only be abolished by violent force. Carter Jackson is co-editor of Reconsidering Roots: Race, Politics, & Memory (Athens: University of Georgia Press). With a forward written by Henry Louis Gates Jr., Reconsidering Roots is the first scholarly collection of essays devoted entirely to understanding the remarkable tenacity of the film’s visual, cultural, and political influence on American history. Carter Jackson and Erica Ball have also edited a Special Issue on the 40th Anniversary of Roots for Transition Magazine (Issue 122}. Carter Jackson was also featured in the History Channel's documentary, “Roots: A History Revealed” which was nominated for a NAACP Image Award in 2016. Carter Jackson's essays have been featured in The Atlantic, Transition Magazine, The Conversation, Boston’s NPR Blog Cognoscenti, AAIHS’s Black Perspectives blog, and Quartz, where her article was named one of the top 13 essays of 2014. She has also been interviewed for the New York Times, Al Jazeera International, Slate, The Telegraph, CBC, and Radio One. Carter Jackson also sits on the board for Transition Magazine where other essays of hers have been published. Hauwa Ibrahim is an international human rights and Shariah law attorney with over twenty years of experience representing women and children condemned to death in Shariah courts. 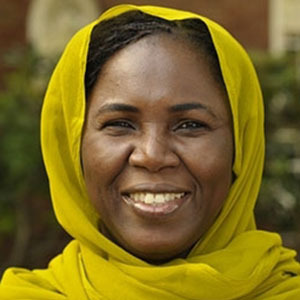 Ibrahim is the founder of Aries Law Firm and author of “Practicing Shariah Law: Seven Strategies for Achieving Justice in Shariah Courts.” She has served as Envoy for the United Nations, on the International Bar Association’s Council on Human Rights, and on Nigeria’s Presidential Panel to Review Compliance of the Armed Forces with Human Rights Obligations and Rules of Engagement. Ibrahim has appeared before the United States Senate and the House of Representatives. She was a Visiting Lecturer at Harvard Divinity School; a Visiting Professor at the University of Rome, Italy; and a Senior Fellow at the Majlis El-Hassan in the Hashemite Kingdom of Jordan. Ibrahim was honored with the 2005 Sakharov Prize for Freedom of Thought. Her current research addresses root causes of terrorism and radicalization of youth. Dr. Tracey Cameron is the assistant dean of intercultural education, director of Harambee House, and advisor to students of African descent. In these roles, she supports the efforts of the Office of Intercultural Education and oversees student success initiatives; manages the operations of Harambee House (the Black cultural center); supervises programming for the campus community; and serves as a resource and advocate for students of African descent. Prior to coming to Wellesley, she worked as a graduate assistant in the Office of the Provost at Virginia Tech where she focused on various research initiatives relative to faculty diversity, recruitment, and retention. She also worked as a university administrator and adjunct faculty member at the Women’s College of Brenau University. Dr. Cameron’s research interests include higher education work/life policy; higher education staffing practices; and the interesectionality of race, gender, and class and its impact on feminist/womanist identity development; and critical pedagogy. She is a member of the Association for the Study of Higher Education (ASHE), American Educational Research Association (AERA), American College Personnel Association (ACPA), and National Association for Student Personnel Administrators (NASPA). Shona supports several initiatives within the Scholars Program team. Prior to joining the Foundation, Shona spent eight years working overseas where she led child protection and child rights governance programs for Save the Children in Sierra Leone, the Democratic Republic of Congo and Chad. She also worked with Right To Play and a national organization implementing projects for vulnerable children and youth in Thailand. Shona completed a Master of International Development Studies at Dalhousie University and a Bachelor of History and Political Science at Mount Allison University. President Sirleaf was elected President of the Republic of Liberia in 2005, two years after the nation’s bloody civil war ended. Her historic inauguration as Africa’s first democratically elected head of state took place on January 16, 2006. Prior to the election, she had served in the transitional government, where she chaired the Governance Reform Commission and led the country’s anti-corruption reform. She won reelection in November 2011. During her two terms as president, Johnson Sirleaf has focused on rebuilding the country, attracting over $16 billion in foreign direct investment. She has also attracted more than $5 million in private resources to rebuild schools, clinics and markets, and fund scholarships for capacity building. She successfully negotiated $4.6 billion in external debt forgiveness and the lifting of UN trade sanctions, which have allowed Liberia to once again access international markets. She increased the national budget from $80 million in 2006 to over $672 million in 2012, with an annual GDP growth rate of more than 7%. In June 2016, President Sirleaf was elected the first female Chairperson of the Economic Community of West African States (ECOWAS) for a twelve-month term. In May 2012, she was appointed co-chair of the United Nations Secretary General’s High-Level Panel of Eminent Persons on the Post-2015 Development Agenda. The panel is tasked with crafting a roadmap for global recovery and sustainable development. President Sirleaf began her career in the Treasury Department in Liberia in 1965. In 1979, she rose to the position of Minister of Finance and introduced measures to curb the mismanagement of government finances. After the 1980 military coup d’état, she became president of the Liberian Bank for Development and Investment, but fled Liberia that same year, escaping an increasingly suppressive military government. Johnson Sirleaf has also served as vice president of Citicorp’s Africa regional office in Nairobi, as senior loan officer at the World Bank, and as a vice president for Equator Bank. 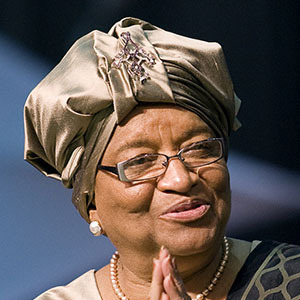 Prior to her first campaign for the presidency, Johnson Sirleaf served as assistant administrator of the United Nations Development Programme and as director of its Regional Bureau of Africa, with the rank of assistant secretary-general of the United Nations, a post she resigned to contest the 1997 presidential elections. After coming in second, she went into self-imposed exile in neighboring Cote d’Ivoire (Ivory Coast). While in exile, she established a venture capital vehicle for African entrepreneurs and founded Measuagoon, a Liberian community development NGO. President Sirleaf has been awarded honorary doctorates by more than 15 institutions, including: Tilburg University (Netherlands), the Nigerian Defence Academy, the University of Massachusetts Medical School, Harvard University, Rutgers University, Yale University, Georgetown University, the University of Abeokuta (Nigeria), the University of Minnesota, Furman University of South Carolina, Brown University, Indiana University, Dartmouth College, Concordia University, Langston University, Spelman College and Marquette University. In addition to her Nobel Prize, President Sirleaf is the recipient of numerous honors, including: the Indira Gandhi Prize for Peace Disarmament and Development (2012), the African Gender Award (2011), Friend of the Media Award (2010), FUECH Grand Cross Award (2009), FAO’s CERES Medal (2008), Golden Plate Award (2008), International Women’s Leadership Award (2008), International Crisis Group Fred Cuny Award for the Prevention of Deadly Crisis (2008); James and Eunice K. Matthews Bridge Building Award (2008), American Academy of Achievement Golden Plate Award (2008), National Civil Rights Museum Annual Freedom Award (2007), National Democratic Institute Harriman Award (2007), Bishop T. Walker Humanitarian Award (2007), Gold Medal of the President of the Italian Republic (2006), Africa Prize for Leadership for the Sustainable End of Hunger (2006), National Reconciliation Award (2006), International Woman of the Year (2006), and International Republican Institute Freedom Award (2006). Born Ellen Eugenia Johnson, President Sirleaf is the granddaughter of a traditional chief of renown in western Liberia and a market woman from the southeast. U.S. educated, she holds a Master in Public Administration (MPA) from Harvard University’s Kennedy School of Government. She also earned a degree in accounting at Madison Business College in Wisconsin and received a diploma from the University of Colorado’s Economics Institute. President Sirleaf has written widely on financial, development and human rights issues, and in 2008 she published her critically acclaimed memoir, This Child Will Be Great. She is the proud mother of four sons and grandmother of 11. Ambassador Linda Thomas-Greenfield is a Senior Counselor at ASG, where she draws on her long and distinguished career as a U.S. diplomat to help the clients of ASG’s Africa practice. She joined ASG after serving as U.S. Assistant Secretary of State for African Affairs (2013–2017). In this capacity, Ambassador Thomas-Greenfield led U.S. policy toward sub-Saharan Africa, with a focus on peace and security, democracy and governance, economic empowerment and investment opportunities. Prior to this appointment, she served as Director General of the Foreign Service and Director of Human Resources where she oversaw all personnel functions for the U.S. Department of State’s 70,000-strong workforce. Previously, Ambassador Thomas-Greenfield served as U.S. Ambassador to Liberia (2008-2012) and held postings in Switzerland (at the U.S. Mission to the United Nations), Pakistan, Kenya, The Gambia, Nigeria, and Jamaica. Her Washington postings include the Bureau of African Affairs, where she served as Principal Deputy Assistant Secretary, and the Bureau of Population, Refugees and Migration, where she served as Deputy Assistant Secretary. Prior to joining the U.S. Department of State, Ambassador Thomas-Greenfield taught political science at Bucknell University in Pennsylvania. Ambassador Thomas-Greenfield was awarded the Hubert Humphrey Public Leadership Award, the Bishop John T. Walker Distinguished Humanitarian Service Award, and the Warren Christopher Award for Outstanding Achievement in Global Affairs. She has also received the Presidential Rank Award and the Secretary’s Distinguished Service Award. She earned a bachelor's degree from Louisiana State University and a master's degree from the University of Wisconsin, where she worked towards a PhD. Ambassador Thomas-Greenfield is also a Distinguished Resident Fellow in African Affairs at the Institute for the Study of Diplomacy at Georgetown University Walsh School of Foreign Service. A conversation on advancing women’s leadership in Africa. Enjoy videos of the keynote lectures. For video recordings of all the events, see the playlist. Is the conference open only to women and girls? No. All are welcome to attend the conference. The conference is generously sponsored by Mastercard Foundation. No fees are associated with registration; however, guests must pay for their own travel and accommodations. Where can I receive details about the hotel? Once you register for the conference, you will receive details about how to reserve your hotel room. We have partnered with a local hotel for conference rates. A light continental breakfast and light meals will be provided for registered conference attendees. If you anticipate needing extra meals, there are a variety of restaurants within a five-minute drive of the campus. The conference attire is business and business casual. The weather in New England in spring is often unpredictable, and March can be chilly and even snowy. Prepare by bringing a warm coat, wearing snow/rain-ready shoes, and carrying an umbrella. 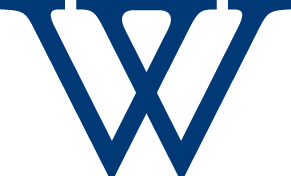 How far is Wellesley College from Logan Boston airport? If you are arriving at Boston Logan International Airport, allow at least one hour by taxi to the campus and/or hotel. Taxi rates are typically $50 to $100 each way. The African Women’s Leadership Conference is funded in part by the Mastercard Foundation. We also thank the following individuals and Wellesley organizations for their generous support: The Madeleine Korbel Albright Institute for Global Affairs, Career Education, Communications & Public Affairs, History Department, Hyunja Laskin Kenner ’88 and Jeffrey Kenner, The Suzy Newhouse Center for the Humanities, Office of the President, Office for Resources, and Wellesley Centers for Women.